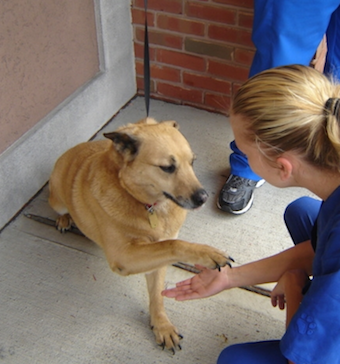 We are very pleased to announce the beginning of the Ridgewood Veterinary Hospital Training and Behavior Modification Programs. We truly believe that all animals deserve to have a home that they feel is safe and secure; this begins with proper socialization and training. We are now offering several classes to help get your new addition off to the right start and to answer all of your training questions. Currently we are offering a Puppy Socialization class, Puppy Basic Obedience and Young Adult/Adult obedience class. All of these classes are 6 week courses and will be held in our Ridgewood office. We are also available for scheduled private training classes and behavior modification visits if you prefer. For our feline friends, we provide private lessons and behavior modification, however, not in a classroom environment. All classes are 6 weeks; the first week is an orientation about our training technique. We encourage the whole family to attend this first session (without pets). After the orientation class, we follow with 5 weeks of training with your new dog. Your total cost goes from $150 to $75, because today you saved a life by adopting! Documentation must be submitted at the first class, and all documentation of subsequent visits and vaccines must be presented as they occur throughout the remaining weeks of class. Thank you for making the decision to adopt a pet today. Please call our office today and a Customer Care Representative will be happy to assist you.